Take this travel bowl wherever you go with your pet. The detachable carabiner makes it easy to carry, especially handy if you have a service animal. The collapsible bowl is 5.5 inches wide and expands to 1.5 or 3 inches high. 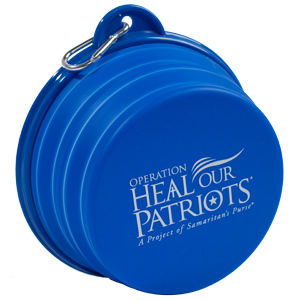 The bright blue bowl with a white Operation Heal Our Patriots logo matches our dog bandana.